This is the apparent Irish triangle Ufo i recently posted about. The footage was seen at the irish ufo conference and was filmed by senior garda pilot and witnessed by a Fianna Fail (irish) politician. If its a CGi its well done, if anyone knows anymore about the footage please reply to this post. Filmed on a camera phone at 10.35pm on August 3 near Dunboyne was also played and replayed to over 70 delegates who attended the fifth Irish International UFO conference in Carrick-on-Shannon. The triangular shaped image, with lights at each point, which appeared to send a red laser-type light towards earth, drew gasps of amazement from the 70 or so delegates who attended the world premiere of the footage. A senior garda officer who was driving when he noticed the unusual light formation in the sky stopped to film it. "There is no footage like this in the world. It is the most amazing and spectacular I have ever seen," said Carl Nally, co-founder of UFO and Paranormal Research Ireland and joint author of 'Conspiracy of Silence'. This is definitely cool. It'd be nice if there were a ground reference or it flew away or something. Exactly what the Stephensville Texas witnesses saw. This must be high up. The one in Texas was flying low to the ground. It was around a mile long. Lights on each corner. And some kind of spinning oscalating lights in the center. Plasma? very good video and possibly "real" and "credible". fantastic, and is not a fake. I hate to burst your bubble, but this footage was made with computer animation. Its the same footage for a different sighting in south america. There are people out there making disinformation as a joke. And why would u suddenly stop filming something like this, if nothing happens 2 u?? It makes no sence, that the video is suddenly stoped when its the most exithing imo. was not any military expriment. This could easily be faked by someone with the time and resources. Also, I SERIOUSLY doubt this was filmed with a camera phone as was claimed. Camera phones cannot film nearly this well in dim light. They also have fixed focus while I could clearly see focus going in and out on this footage. I'll believe it if a bunch of witnesses come forward, otherwise no. What information do you have access to that suggests it’s the Irish conference footage? “This is a video was on a cheap camera I found when Hiking in the Smokey Mountains. Also according to the latest article in the Meath chronicle then there were four triangles visible suggesting it was indeed a collection of point light sources rather than structured objects. Are you relying soley on the various YouTube comments to establish this is the correct video? The energy generated by these propulsion systems usually distort the atmosphere surrounding them causing blur and rippling. When a video is this clear, it is most likely a hoax. The Youtube description does say it was on a cellphone camera that was found by a hiker. Reeks of BS! Let me guess, the person that took the footage just disappeared and left the phone behind? Gimme a freaking break! I can't buy it. The imaging is too good, to crisp and clear for a cell phone camera. Nice work though... maybe Stephen Speilberg would be interested in something like this for his Close Encounters sequal? yes..sadly this is a fake..whoever this guy is making up the "article" is a BSer..Its a FACT! I believe in UFOs..but this is NOT it!! Its a fake! Ive seen this live and in person in 2007 at "UFO EXPERIENCE" Its a fake built and designed by Jeff Wilson. This has already been proven to be a hoax. The original footage was created for debunking purposes for a UFO convention. The footage you see here as had the original sound removed and touched up. STOP PRESS - COAST TO COAST AM - JOSHUA WHO CREATED THIS SAYS IT WAS A FAKE WHICH WAS REPOSTED BUT WITHOUT HIS ORIGINAL ACCOMPANYING AUDIO CLEARLY STATING THAT THIS WAS A FAKE. HE WAS TRYING TO PROVE HOW EASY IT WAS TO FAKE A UFO. Otherwise you're going to look like an idiot to any non believer who believes everything he/she hears and sees without reason. Isn't the irish triangle video a eurofighter typhoon plane in the dark?! Its a fairly new plane? Thats what it looks like to me!! Also if you look at the eurofighter typhoon it moves abit like an alien spaceship might do. The "I found it hiking" bit is designed to make you think the owner of the camera was abducted or something. This is a fraud, a no cell phone adjusts focus or makes such clear video. No wonder so many people believe in Global Warming. i've seen something similar myself over Montreal 4am about 10 yrs ago. no bs. too bad didn't take pic. but personally i think its man made. remember there are many fakes,you know.there are also alot of real video footage.you must keep in mind some pople want us to think they are all garbage.which is not the case.as you must know certain people would like to sweep all this under the rug.it does not matter to me ,i know what i know and no disinformation will convince me otherwise. if its a fake its great but i dont think yu can fake the footage i have observed from the 60s 70s 80s. if it is a phone film then what a phone . i'm a believer but this is i'm sure black projects and the laser well the police use that night light laser day to day,so think what they are testing now and also what the Americans are up to in space for all these years. i do believe but i'm waiting for the smoking gun ,this is not it by far. It is very likely that any Triangular craft seen in our skies is in fact one of OURS!! Thw USAF have long since had 'Electro-Gravetic' drives taken from 'back-engineered' craft captured or crashed in their territory. The US and perhaps other countries have airships. The ships are up to 500' long and roughly the area of three football fields. Search Aeroscraft. Another company is making the triangular shaped craft, but Aeros is the mfg of the ship seen in Stephenville TX. The craft uses helium and nuclear pulse propulsion and is undergoing flight trials. This isn't the Irish footage,this is a well known fake. I have seen the same thing in the United States. I wasn't the only person, other people pulled over to the side of the road to watch it. It moved very slowly and made strange humming sound. I am near an airforce base, so my guess is that it is some type of secret craft. The Irish 'UFO?" is actually, the US Militrary TR-3B or an advanced model. There you will learn the TRUTH! This was not filmed on a camera phone. No way. They cannot focus this well at night and the zoom isn't as much as is zoomed in this footage. Also, the "laser" portion looks very very CGI. To me, its a fake. A really good fake, but a fake. That's not a camera phone. No camera phone has that field depth. Phones are too thin to get that resolution and that optical zooming. and http://speakingofstrange.com/ for full details. The craft was a large black triangle that was lifted in the air with a 14ft diameter advertising helium balloon. it weighed about 10 pounds and as saw in the video it included 3 bright red leds light pods on each corner, a 200mw stage laser, 3 blue led's inside light defusing glass on the rear, and a 4 stage round Electroluminescent (also known as EL)light in the center. It was about 400 feet in the air at night in the mountains outside Asheville, NC. There was stars out but they DID not show up on the video. I personally saw this extraterrestrial craft hover over Bal Harbour Florida in late 1998. It was spectacular in every way. It was enormous in size, totally silent and dissapeared/vanished in the middle of the crystal clear night. This astonishing craft is not human made. It is simply impossible. I would say that it is permanently stationed here on Earth to permanently survey us and our affairs. But one thing is certain. It is not man-made and it was certainly not made in this planet! I personally saw this extraterrestrial craft hover over Bal Harbour Florida in late 1998. It was spectacular in every way. It was enormous in size, totally silent and dissapeared/vanished in the middle of the crystal clear night. Moreover, I also have a witness. This astonishing craft is not man-made. It is simply impossible. I would say that it is permanently stationed here on Earth to permanently survey us and our affairs. But one thing is certain. This film is not fake in any way because it is the exact same craft I saw and have been lookinf for pictures and film clips on the web about for over 10 years. THIS IS NOT FAKE PEOPLE! This is absolutely 100% the real deal. I think that hoaxing should be made a serious criminal offence, whether done for money or for "fun". I am sick of crop circle hoaxers and UFO fakers wasting my time and screwing up two important fields of research just so that they can get their selfish warped jollies. As a true sceptic I would even be prepared for the consequent discovery that both fields could prove to be devoid of any genuine phenomenon worth studying. But I would rather have that than the current situation that these egoistic jerks have created for us. The image appears to go in and out of focus a few times. Camera phones have no focusing mechanism. when did camera phones have auto zoom options? Too clear, too smooth animation-wise and whats with the Zoom ! This wasnt shot on a phone camera. Wheres the encoding errors and noise ? Its too clean to be real. My pick is CGI or Swamp Gas. Great Video! The image is faithful in every detail to the same triangle UFO that I witnessed on 12/25/2001, and have reported with MUFON. I could not have captured this in photos as the sky was nearing pitch dark that evening, and the UFO surfaces seemed transluscent, and glossy as a piano, or streched mylar! - Do not confuse the term 'laser' with the 'streaking' star-effects coming from the corner lamp unit(s.) These units can change focus, throwing a pin-point a mile or so, to a broad circle of any size. They operate at near Daylight (HMI) precisely like those made by Varilites, HighEnd, et. all. read the youtube description fools. its a rig. suspended with a big helium baloon. Its not fake and its not extra terrestrial. These are sighted all over the world and are simply the most recent evolution of advanced military craft. Full details of their construction and propulsion systems are available at HitEnter.Co.Uk, click on the 'Space' tab and scroll down to the 'Black Triangles' link. All is revealed. Hang around at RAF Kinross in Scotland and you can see them land. They are unaffected by gravity, so can swoop in at Mach whatever, stop dead, and float to a hovering position. The pilots need to wear a protective coverall for some reason, but as there is no gravity there is no inertia. Hence they can accelerate and decelarate without the pilot suffering any ill effects. This is obviously a weather balloon or a helicopter. It is most obvious given the red lights, and the angle of the camera. it just looks odd because of the angle it is fimed at. the object in question is most likely a helicopter, or a jet on approach to Dublin Airport. Aliens do not exist, and this kind of craft simply does not exist. My friend and I saw something exactly like this..above freeway 101 in california, USA! It was the evening of february 12. it was too low to be an airplane and it couldnt have been a helicopter because it wasn't making any noise. Curious how few people connect the dots. Oh well, I think I will go and watch the 1968 classic movie the Night of the Living Dead. You can watch it for free on the web. I have never put much stock into the UFO/Alien theory but these triangle UFOs have me really troubled. From the Belgium incident to the recent sighting over Miami and this. They are the same type of craft in case. Their performance characteristics are such that they have no like on Earth. From footage taken, it seems they are almost automated in nature. They don't seem hostile, from the Belgium wave, they simply evade, as if almost programatically, when a threat enters somes sphere of influence. I don't want to turn this into an essay... I am not so concerned with their origin, alien or otherwise (the former which seems likely), but rather, I would like to know what their mission is. Does anyone have any theories? Hi there,I just want you to know that this footage is NOT the footage you think it is. This is NOT the Irish triangle ufo footage at all! !That footage has NOT been released onto the internet at all!The footage above is indeed fake and it did appear at around the same time as the news announcing the Irish triangle footage, which to me is very strange considering the fake has come to be associated with a real incident, and existing original footage,which it does not represent at all.I might add, that the original footage has been shown at conferences in Ireland but has never been seen on the internet. I dont remember which site this footage, and the original headline appeared on, but I do believe there is a deliberate attempt to draw attention away from the original footage for some reason. Also I find the woman who came forward announcing the footage to be of chinese lanterns extremely suspicious in her behaviour. She has maintained that footage(which she has never seen, by the way! )shows chinese lanterns launched by her at her wedding reception! She believes this to be true despite two main factors that this could not possibly be true, which are-1. She is talking about the video shown on your site above, which we have established,does not show the original Irish event at all!! !2.The other factor is that she has not seen the original footage shot in Dunboyne at all, so how could she say what it showed?? Also, I believe her behaviour and what she has to say on various sites in regard to this case extremely strange and both she, and her logic are questionable at best. She is a woman who went to great pains to launch chinese baloons at her wedding bash, going so far as according to her, seeking permission from the aviation authority and also the local gardai, to launch these baloons when anyone else would not have bothered going to such lengths. At the same time all of this occured, because of the confusion surrounding the above footage being associated with the Irish triangle footage, other videos surfaced on the internet depicting the exact same kind of thing the one above does. Each of these other videos each had their turn being associated with the,by now, mysterious Irish triangle footage, but of course in the end each one was debunked as being fake and eventually dissapeared or whatever but I still wonder what exactly happened here?Of course Carl Nally didnt do anything to help matters. He could have easily come forward and helped clear up some of the confusion but he seems to have been quite happy to sit back and say nothing,however there is a short piece of footage on youtube recorded last year where he says that the footage above, turned up on the internet pertaining to be THE footage but that of course it was fake and that the real footage will not be released onto the internet because of exactly this sort of thing. To me, the whole episode reeks of deception, but who is the deceiver? I honestly dont know, all parties have acted very strangely. I live in Toledo Ohio and we saw 4 of the same "real" UFO's and about ten minutes later we saw about 6 white ones that only had one light. I have seen these twice living in Florida. And both times I have also seen a hovering light above the road separate from these crafts. I saw the real deal in 2003. Black Triangle was hovering right over top of water tower in Pillager, Mn. 5:00 a.m. January 12th, 2003. The Triangle had one HUGE, sparkling, light on tip of each point of triangle. The weird output of each light, was like a million spatkling lights within the one. The HUGE light on each tip were the size of a house. Ii know this as the triangle floated right over me. 300 ft. or so in the sky. As it was above me l could see its massive size! 6 blocks or so wide. It was non-reflective. The stars were blotted out behind it. I could see assorted, angular structures on its belly. When it excellerated, a circular, multicolored light, deaf center, lit up and spun. A very low HZ, tactile hum came with the spinning light and awawy it went. Floating in a smoothe, then instant skipping motion. Disappearing into the eastern, black sky. The way the humming noise vibrated my slin & shook my arm hair..was .not like any jet l've ever heard. Never seen or heard anything like that! Before or since. The video here is close to what l saw..but it lacks the sheer size and creepiness. I KNOW our military is wicked, but, if its advanced enuff to design & fly the Triangle l saw? Then the U.S.A. Military is unstoppable! in 1995 i saw the triangles over a suburb of dublin. still remeber it like yesterday. I have seen them,photograph them, sat and watched them move through our skys fast and slow,and so have millions of other people,but what shocks me the most is that their is not one govenment agencey anywhere on this planet that will stand up and say yes THEY ARE HERE and lets all pool together and gather as much information as we can and learn as much as we can,but NO they leave us out here all pulling the piss out of each other,its so damm anoying,OF COURSE THERE HERE,only if we could work together and someone at the top would stand up and say THEY ARE HERE,lets all work together and try and learn,Oh well i suppose it will never happen,But dont stop taking those marvelous photos and videos, good on you all. Myself and my daughter and her little half sister saw this UFO about two years ago... I was leaving them home around 7:30 on a Sunday evening. I had just left my mothers house and was coming to the junction near the end of her street when I noticed the red lights moving in the sky above me. I knew immediately that it wasn't anything "normally" seen in the sky because it was huge and I mean absolutely huge...I asked my daughter could she see it? And she said yes and asked what it was?. I stopped the car and we got out and watched it move slowly and completely silently until it went out of sight. It had a huge round ball in the centre and it was rotating...it looked like a fire ball but was completely round and rotating. I've googled triangular UFOs and have seen pictures of what we saw and am happy knowing that others too have seen this "thing" in the sky. Trust me,this is real whatever it is and honestly don't believe it to be man made or made on this planet! I'm from Co. Donegal by the way! 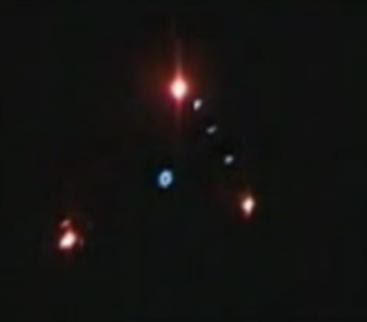 I saw virtually the exact same object over my place about 1999-2000 sparkling lights at every corner, a bright red one in the middle that sparkled out of sequence with the three corners, it was flying very low and looked to be made of a dark metallic material, strange thing is it was flying on edge pointing up not laying flat, it didnt make a sound. I watched it for about 10 minutes as it moved away slowly and it then seemed to "jump" in the sky from one place to another and it then took a 90 degree turn and dissappeared. It felt very unearthly. I have seen these alot lately. Exactly like this one. The first time was about 4 months ago. I saw an orange orb in the sky and thought hmm whered that come from, then another. I wondered if it was an alien or whatever, and if it was maybe it could be telepathic. I started talking to it, just like hello, how are you, what are you doing stuff. Then I asked it to watch over me and make sure I didnt hit another deer, because 2 had hit my car within months of eachother and the last one had been on that road. RT 49 in Connecticut. Then both of them got closer, still orb looking, following me. Sometimes they would loop around me, speed up an wait, or go my speed. Then about halfway thru my ride, one of them is at the tree line and goes right over the road, like it wanted me to see it. The light in the middle was bigger than the rest of the lights, and looked circular in shape. COMPLETELY silent the whole time. Both followed me untill the end of 49 when it gets into R.I. This was just the fist of the sightings. I see these triangle ones at least once every 2 weeks now, and other ones daily/nightly, Yes they are out in the day.